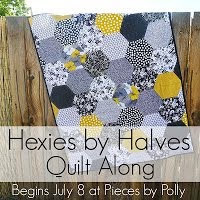 Val's Quilting Studio : Hexi W.I.P. I participated in my first Quilt Along and it's my LAST W.I.P. on my Summer To Do list...as I head back to school Aug. 19th. This is providing me with some easy sewing during the hot afternoons we are having right not. I love the colors and know I have some yardage in my stash for the backing. This quilt was a last minute creation and even more rewarding is the fact that I already had 90% of the fabrics...so it's a true "stash" buster. (Isn't that the best feeling!) I'll be sure to create a post of it when it's finished. Oh my! I saw your hexi pic linked up at Lee's WIP and I though it was mine! They are not really alike, but in the tiny thumbnail pic they sure looked like it! Same colors! Your hexi quilt is fabulous!! Great job using your stash...that is one of the best feelings!! Cute hexies! I just did a small wall hanging with hexies done whole and pieced by machine. Not as easy as this looks! How neat, love the colors and I'm working on a pillow with colors like this from my oldie stash! Thanks for sharing. very nice, love the color combo!! Neat looking hexie quilt! I made a similar pattern several years ago where the hexies were half pieces. The centers either have flowers or circles appliqued in them. Anyways, it is such a fun and easy way making a hexie quilt. Your colors are really nice!